How can I custom title for page turning publication? Q: I am going to create a page turning brochure for my company, for advertising my company, I would like to use company name as brochure title. What should I do to achieve this? A: First of all you have to know that only page turn book in Float template enable user to change the title with custom one. Classical and Spread templates don't apply book titles on generated e-publications, and Neat template allows user to custom book logo. Following is the tutorial on how to custom book title, you can find it easy and useful. 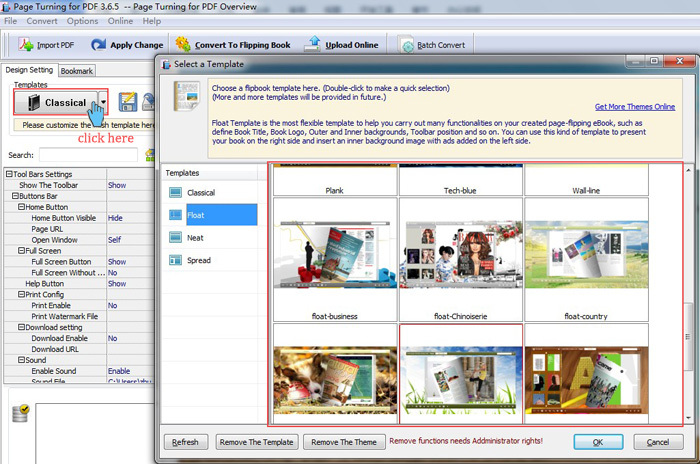 Step 1 : Launch your Page Turning software and import document. Step 3 : Search Design Settings box for option of "Book Title", then input your custom title into the textbox of option (e.g. www.page-turning-maker.com). Step 4 : Back to toolbar of software and choose "Apply Change" option to implement previous settings. Note: Before you choose "Apply Change", the configuration you have define won't be applied to your virtual page turning publication. So please make sure you have completely finish all the steps.